The techniques of sculpting were not very different. The outline of a statue was marked on an appropriate piece of stone with red ochre. The piece was then roughly blocked out and the features modeled. In the case of soft stones such as limestone, chisels could be used as well as saws. Hard, volcanic stones could only be worked with similarly dense materials. The amount of time, patience and manpower used to create a colossal statue of granite almost defies the modern imagination. Among other ancient Egyptian crafts techniques not depicted in the tomb of Apuki and Nebamun, the manufacture of glass and glazed ware is characteristically Egyptian. Glazed composition (faience) is known from the predynastic period onwards. It consists of quartz ground to a fine powder, possibly mixed with a weak solution of natron to make the material malleable. Objects of glazed composition could be formed by hand or on a wheel, but many small pieces were shaped in pottery moulds. The glaze was similar in composition to glass, being made of sand and natron salt. It was probably applied as a fluid coating which fused with the body material on firing, creating an object of great strength; the usual color for the glaze was blue-green or turquoise, created by tee inclusion of copper or malachite. Nevertheless, it was possible to produce other colors: objects of red, white, yellow and green proliferate during the late Eighteenth Dynasty. Although the glaze used on faience is similar in composition to glass, glass proper was not made in Egypt until the Eighteenth Dynasty and it seems likely that the technique was introduced from Syria. Glass production involved the heating together of quartz and natron with a coloring compound, usually a copper-based blue. The molten glass could be moulded, shaped into rods or formed round a core, but blown glass was not known until the Roman Period. Core-forming involved the creation of a sandy core in the shape of the inside of the intended vessel. This was then dipped into the molten glass and twirled round, creating a skin of uneven thickness which could be worked to the required shape. Bases and handles were added separately. Decoration in different colors was often applied o the form of rods of glass which meted on contact with the hot body of the vessel. A tool drowns across the bars of color created a ripple-pattern effect. 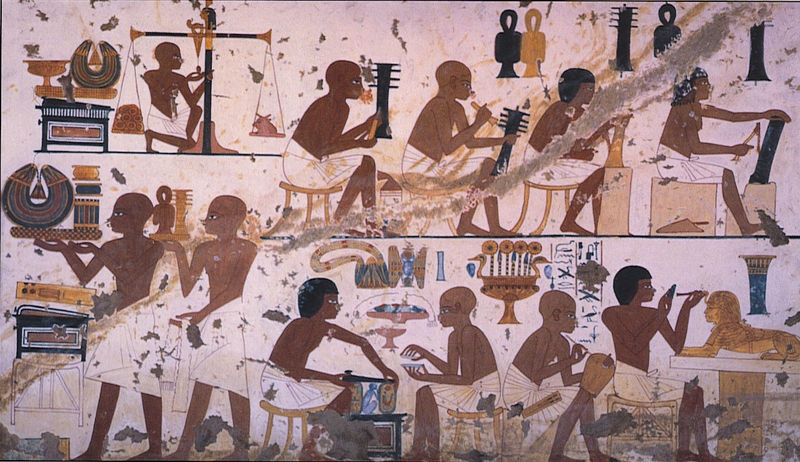 Weaving was another major ancient Egyptian crafts of the ancient Egyptians, dating back to early predynastic times. The cloth that used was made of linen, and the cultivation and treatment flax has already been described. The linen fiber, having been beaten from the plant, was spun on a stick weighted at one end with a circular whorl, either flat or domed, until the New Kingdom, women alone spun thread, but thereafter men also took part in this operation. The same is true of weaving. The loom in Egypt was at first horizontal, but was replaced by a vertical type during the Second Intermediate Period. A great variety of cloth was produced, from coarse homespun to fine linen, as sheer as muslin, known as byssos. Most cloth was plain, although sometimes pattern of loose threads was woven in. The Egyptians mastered the techniques of making fine stone vessels at an early date, utilizing the great range of ornamental stone to be found in the desert and hills which border the Nile. A block of stone would be cut to the appropriate dimensions, probably with a saw. The shape of the vessel was then roughly formed with a chisel or a drill. Smoothing followed, using abrasive stone rubbers worked up and down the object. When the outside was completely shaped, the inside was hollowed out. This was achieved using a drill with an offset crank handle at the top, as shown in the scene. The drill was set with a stone bit of flint, limestone, sandstone or diorite shaped for different types of vessel or phases of the work. Some drill bits were formed of copper tubes which could remove cylindrical cores. A chisel could then be used to remove the surrounding martial. Some vessels were made in sections and then cemented together. This applied especially to ornate vessels with narrow mouths. As with bead drilling, emery or quartz was used as an abrasive.